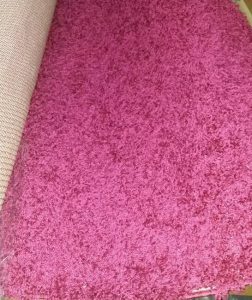 A large hot pink rectangular shaggy area rug. 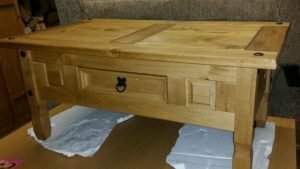 A large solid pine rectangular coffee table, having one drawer to either side. 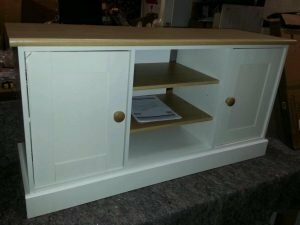 A hand painted white solid pine sideboard unit, having one cupboard to either side of two central shelves. 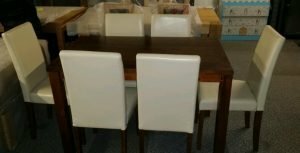 A large solid mahogany rectangular dining table, together with six matching high back dining chairs, upholstered in white faux leather. 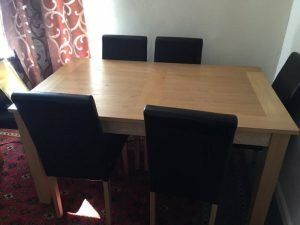 A large rectangular solid wood dining table, together with four high back dining chairs, upholstered in black faux leather. 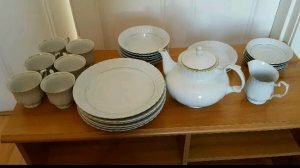 A vintage white porcelain part dinner service, to include a large teapot, dinner plates, teacups, a milk jug etc. 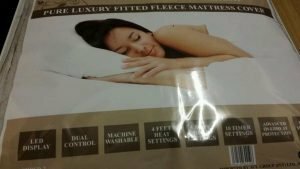 A brand new luxury fitted double fleece mattress cover. 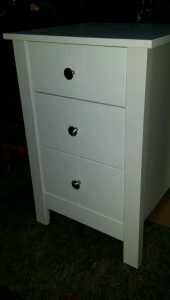 A tall white solid wood bedside chest of drawers, having three chrome handled drawers. 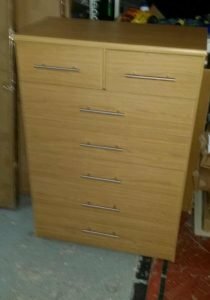 A tall standing solid wood chest of drawers with chrome handles, having two small over five large drawers. 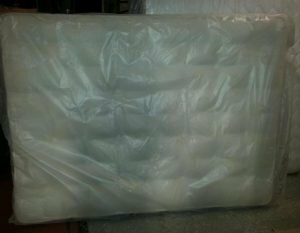 A brand new still packaged quilted king size mattress. 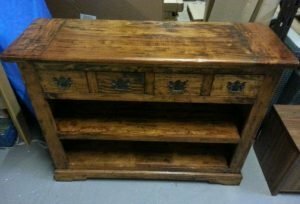 A tall solid oak rustic style console table, having four small drawers above two shelves. 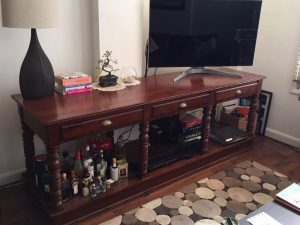 A solid mahogany large three drawer sideboard, together with a 32 inch flat screen smart television. 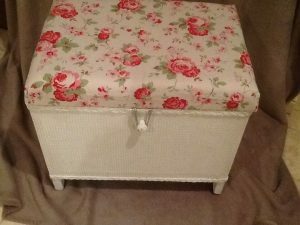 A small painted white Lloyd Loom blanket box, upholstered in rose printed fabric. 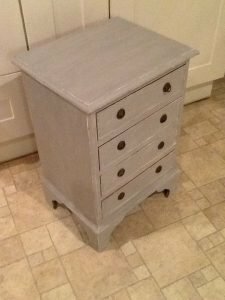 A hand painted grey solid wood chest of drawers, having four large drawers. 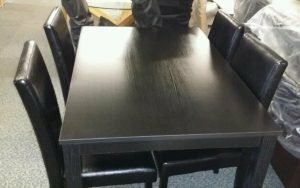 A large solid pine rectangular dining table, together with six matching high back dining chairs, upholstered in black faux leather. A tall standing vintage dark oak and glass display dresser, having a double cupboard above a pull down shelf and two drawers. 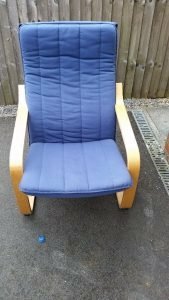 A solid pine high back armchair, upholstered in blue cotton fabric. 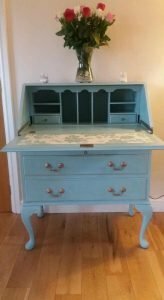 A hand painted blue solid wood vintage bureau, having a pull down shelving area above three drawers. 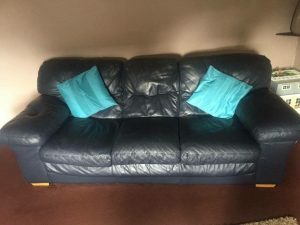 A three seater high back sofa on solid pine square legs, upholstered in navy blue authentic leather. 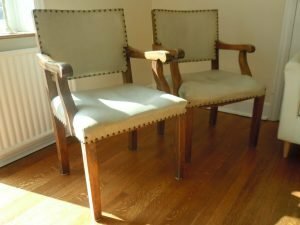 A pair of solid oak high back vintage armchairs, upholstered in cream leather with brass studded detail.